Almost every modern manufacturing process relies on industrial gases, and sales of such gases are expected to rise by around 45% over the next five years. 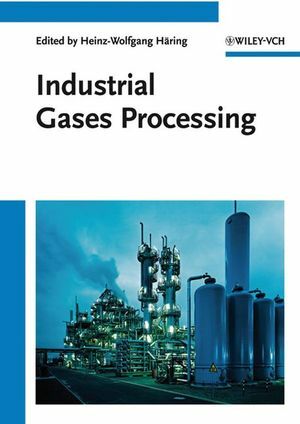 Here, experienced and authoritative experts from one of the two world's largest producer of industrial gases impart their knowledge on atmospheric, noble and synthesized gases, carbon dioxide, LNG, acetylene and other fuel gases, as well as special and medical gases. Modern applications, e.g., the use of hydrogen in fuel cells, are included as well. This practical text is rounded off by a section on logistics. Heinz-Wolfgang Häring studied chemistry at the Ludwig Maximilian University in Munich, Germany, graduating in 1972. He gained his doctorate in 1978 in metal-organic chemistry, joining Linde Engineering, a division of the current Linde Group, one year later. He was initially responsible for material selection in the various processing plants, from steamcrackers to hydrogen plants and air separation units, and for material and corrosion investigations in the event of equipment failure. In 1983, after further qualification as a welding engineer, he became head of the Material Testing Department. From here he advanced to Quality Assurance Manager in 1990, and has since held managerial posts in Materials Technology and Engineering Services Mechanical Equipment. Finally, Dr. Häring returned to chemistry and in 2001 became responsible for Chemical R&D, including the analytical services for the various process plants.